Hard, directed training is the way to win. There's no cheat. The best of the best go harder and longer, and do it everyday. We know this is true. Sustained high intensity cardio plus spot specific muscle activation and lifting, created by Lisa Giannone. Multi planed, against gravity, impact based training guaranteed to work your entire body, ripping off 900 plus calories per session, kicking up your metabolism, strengthening and defining your body while empowering your mind and building your tolerance for sustained, hard work. Hammer is designed to train your body how to move optimally, efficiently and to be injury resistant. INCLUDES MASTER HAMMER, HAMMER YOUTH PLUS, HAMMER EDGE AND HAMMER LIFT. We offer one on one personal training in the style, philosophy and expertise of the Garage. Please contact us with your training goals and desires and we will match you with one of our specialty trained professionals who will assure that you meet your fitness/athletic goals. At the Garage, “training like a sport” is an important concept and everything we do is aimed at improving performance and preventing injury in the competitive arena. We can create custom pre-, in-, or off-season training programs crafted with specific goals based on your group/team’s needs. We have created and run conditioning, prevention and dynamic warm-up programs for Marin FC, USF, Stanford, San Francisco Ballet School, Pro Athlete Summer Camps, SF Day School and several independent high school/college/university groups. Make your team stronger, more durable, better performing athletes with our specialized training programs. The Garage will be an asset to your school, group, team and its coaches. An innovative full body cardio boxing routine blended with the sounds of live Conga drums. Taught by Karim "Hard Hitta" Mayfield, former NABO junior welterweight champion, this world class system allows the average joes to train like the pros without the blows. Learn professional technique and dynamic footwork. Long time strength and conditioning sports scientist/coach and well known for his training accomplishments in the NBA, John Murray spent his formative years as Head Strength and Conditioning Coach for the Warriors, and as Director of Strength and Conditioning at Stanford University men's and women's basketball. Sensing the need for a new kind of ballet school in San Francisco, Ms. Spratlin established the Dance Training Center / San Francisco in January of 2014. A school with the highest quality of training, smaller classes and a less competitive environment than some larger schools, DTC/SF strives to give individual attention to students in a healthy, positive atmosphere. DTC/SF is also a place where professional dancers and students from other ballet schools come to tune-up and work on their technique when recovering from injury. In a former automotive shop in San Francisco’s Richmond District, 25 years of passionate innovation in sports science, performance, and rehabilitation have come together in the form of a unique training center. In addition to classes, The Garage hosts an open gym Monday through Friday from 12:30-3:00pm for members. 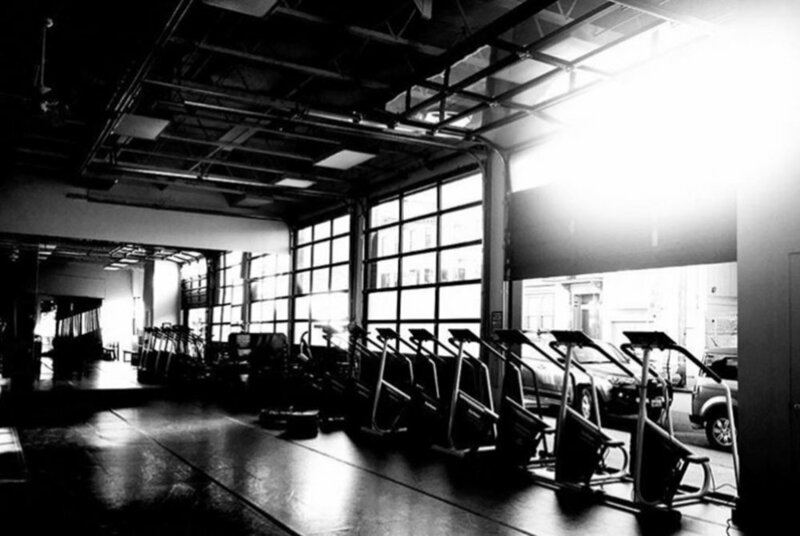 The Garage offers 3,500 square feet of space, purpose-built for high-performance workouts. Three large, operable glass garage doors dominate one wall, allowing for light and ventilation. Beyond amazing space to move, we have the training bells and whistles you need (dumbbells, barbells, kettlebells, rope, chain, Shuttle, Olympic squat rack) and more importantly the Professional Coaching required for performance based strength training. Elevated, professional quality boxing ring and equipment sits in one corner of the space. Heavy bags and a wide variety of pads, gloves allow The Garage to switch from exercise space to boxing space. The specially designed biomechanical floor is sprung at a high level to provide body and joint shock absorption and reduced stressful compression loads during dynamic training programs, allowing you to go hard without break down.